University Hospital's Radiation Oncology Department offers Body "Radiosurgery" for tumors of the lung, spine, liver and other sites. Our physicians and physics staff is the most experienced in the region in providing stereotactic radiosurgery for both the brain and the body. Stereotactic Body Radiation Therapy (SBRT) technology allows delivery of very high doses of radiation with precision accuracy. Treatment can often be completed in one to five treatment sessions - with a high expectation of tumor control and a low risk of toxicity. 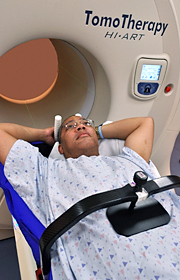 Stereotactic body radiation therapy (SBRT) uses a high dose of radiation therapy that conforms as closely as possible to the tumor while avoiding healthy tissue. Four-Dimensional (4-D) Tumor Imaging: Our 4-D CT scan allows us to visualize motion of the tumor and surrounding organs during the breathing cycle. BodyFix Immobilization /Abdominal Compression: The BodyFix immobilization device ensures accurate patient positioning and holds the patient in the proper position during the entire treatment. Abdominal compression can also be applied to reduce tumor motion that occurs with breathing. 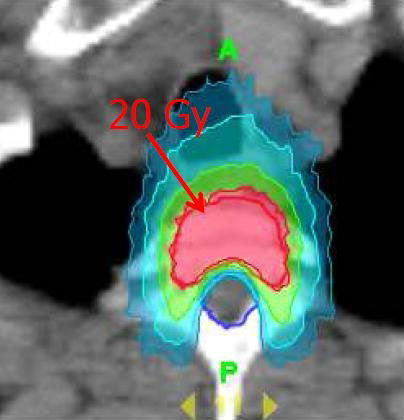 Cone-Beam CT Imaging: Three-dimensional image-guided radiation therapy (IGRT) with a CT can be performed at any point during treatment to ensure proper positioning of the radiation beam. This feature also allows monitoring of changes in the size and shape of the tumor during the treatment course. Respiratory Gating: For tumors that move during breathing, the treatment machine can be programmed only to turn on when the tumor is in the appropriate position. 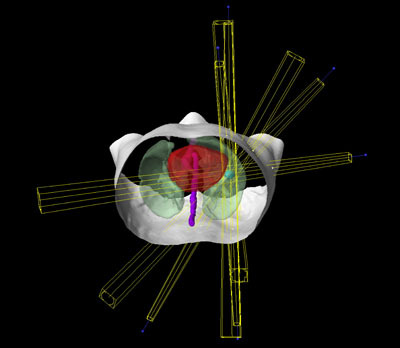 Cine Mode Tumor Visualization: This application allows the radiation beam and tumor to be viewed (like a movie) during the actual treatment to guarantee that the tumor is properly covered by the radiation beam. All of these features may be important when very intense doses of radiotherapy are given such as with SBRT. Typically a full course of SBRT can be completed in 3 to 5 sessions, and some tumors may require only a single treatment.